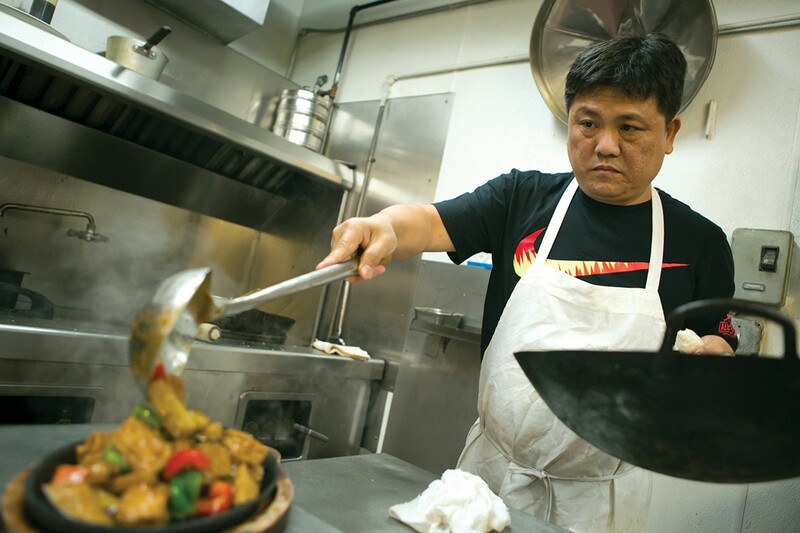 An accomplished Cantonese chef applies his craft to vegetables and mock meats. Hours: Daily 11 a.m.–3 p.m., 4:30–9:30 p.m. There aren't too many hard-and-fast rules in the food journalism biz, but I'm fairly certain this is one: When you find out that there's a Chinese vegetarian restaurant in Hayward called Veggie Lee — run by a guy whose name, literally, is Veggie Lee — you get in a car and book it to Hayward the first chance you get. I really didn't have any choice in the matter. No one wants to read about a mediocre vegetarian restaurant, though, even if it does have an unusual name and charming backstory. Fortunately, the food at Veggie Lee is good enough to stand on its own merits. It should probably come as no surprise that "Veggie" isn't chef-owner Che Heng Lee's given name. It's the English nickname he chose for himself when he swore off meat eight years ago. Lee had been the executive chef at Daimo, a well-regarded Cantonese restaurant in Richmond, for about six years during the early Aughts. Later, he was the chef and owner of Daimo's San Leandro branch. At Daimo, Lee specialized in cooking seafood. But problems with his weight and cholesterol eventually prompted him to adopt a vegetarian diet, which he credits with helping him lose thirty pounds. All the while, he was still serving meat to his customers, but he felt guilty. He had come to the conclusion that they, too, would be healthier if they ate only vegetables. So, Lee sold his San Leandro restaurant and, a little over a year ago, opened Veggie Lee, a vegetarian eatery located in a small, quiet shopping plaza in Hayward. The idea would be for Lee to take the skills he honed during all those years of cooking meat and fish and apply them to vegetable cookery. 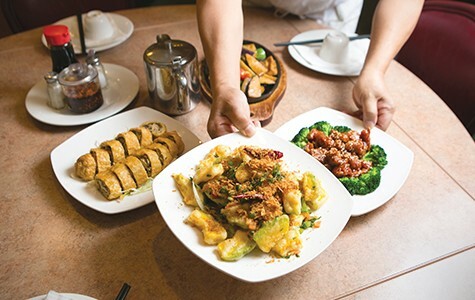 In short, he didn't want to open just any vegetarian restaurant: He wanted to open a legitimately great Cantonese restaurant — one that just happened not to serve any meat. Whatever you think of Daimo (I've generally had good meals at the Richmond location), the chef's pedigree sets Veggie Lee apart from your run-of-the-mill Chinese vegetarian restaurant, whose proprietors might have earned their cooking chops at a more generic, Americanized Chinese restaurant, or who might come at vegetarian cooking from more of a religious (usually Buddhist) standpoint than a culinary one. The hallmark of this genre of Chinese cuisine is, of course, its use of "mock meats": wheat gluten (aka seitan) manipulated into as many shapes and textural variations as there are creatures that inhabit the land and sea — or so it seems, anyway. And indeed, dishes that prominently feature gluten-based alternatives to beef, pork, chicken, and assorted seafood take up the bulk of the menu. By and large, the wheat-gluten products themselves aren't made in-house — Lee buys them from a Los Angeles-based company. But just as two omnivore chefs with vastly different levels of competence might start with the same cut of meat, fake-meat cookery, too, is all about what you do with the product afterward — how you cook it, season it, and so forth. On the other end of the spectrum, I had my first bowl of vegan shark's fin soup. The "fins" were fashioned out of konjac (a plant used to make a kind of vegan gelatin) so that they resembled short, thick vermicelli. The soup itself was kind of bland, highlighting the texture of those fins rather than the taste — which made the dish quite authentic to my experience of actual shark's fin soup. Meanwhile, my tablemates were weirded out by the appearance of the vegan prawns, which, oddly enough, seemed modeled after raw shrimp, and were gray and slightly slimy-looking. But the impressive thing about the dish of vegan prawns, tomatoes, and sizzling rice was the crispy rice topping — which arrived at the table as toasty and crunchy as it ought to be, despite the tendency of otherwise respectable Chinese restaurants to botch it and serve up a soggy mess. One of my favorite dishes was an eggplant and vegan fish-steak combination, which came out sizzling and billowing steam from atop a hot cast-iron platter. The "fish" was sliced to a similar size and shape as the eggplant, and, to my surprise, was uncannily fish-like — something akin to salmon steak in both flavor and texture, with bits of saltiness that clung to its surface, just like you get with a nicely grilled piece of fish. A vegan shacha sauce (a kind of umami-forward Chinese barbecue sauce) provided the deeply savory, fishy flavor, Lee explained. As tasty as the vegan fish-steak was — a phrase I never thought I would write — what I really appreciated about the dish was all of the other components: soft, custardy fried tofu; slices of zucchini; and eggplant cooked to just the right degree of sauce-sopping softness. 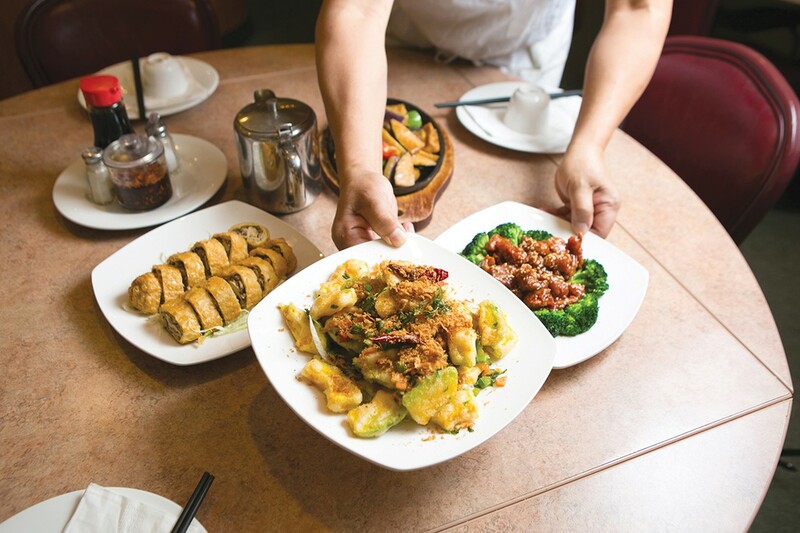 In the end, there are two main reasons for the meat-eater to dine at a place like Veggie Lee. One is for the fake meats — the novelty of, "Oh, that really does look like shrimp, and doesn't taste terrible." But the second, and more important one, is that many of the vegetable-centric dishes are great in their own right — with the vegetables themselves, rather than the vegan meats, playing the central role. Indeed, many of the best dishes didn't have any meat proxy whatsoever, and were instead the kinds of items you might get at a higher-tier Cantonese banquet house. Lee prides himself on his work with tofu skin, and his pan-fried bean curd roll was a thing of beauty — the tofu skin stuffed with mushrooms, rolled up, and then fried until the outside was nice and crispy. And the salt-and-pepper pumpkin — a classic Cantonese prep — was the best version of that dish I've had in years. Deep-fried until the tempura-like batter was shatteringly crisp, each piece of pumpkin was a study in contrasts: salty, sweet, crunchy, and soft. To cater to the many Buddhists who eat at the restaurant, Lee also doesn't use any garlic or onions in his cooking, which you'd think would be one too many handicaps to overcome for a vegetarian restaurant. But no: The garnish for the pumpkin dish consisted of crispy basil leaves and bits of batter-fried seaweed — no shortage of flavor or crunch. And the "toons" pancake, made with a kind of scallion-like green leaf that's popular in Chinese vegetarian cooking, was almost indistinguishable from a pan-fried scallion pancake — and was one of the flakiest, most satisfying versions I've had recently. Despite the availability of such delicacies, Lee told me that most of his customers just wind up ordering things like vegan sweet-and-sour pork, and you get the sense that he's itching to have his skills put to better use. Indeed, the restaurant offers a number of formal banquet options, and special dishes include a $38 steamed cabbage dish that you have to order in advance. Apparently, preparing it is an intensive, two-day procedure that proved a little too complicated for someone with my limited Mandarin comprehension to follow. There aren't many restaurants where I would find a $38 cabbage dish even remotely tempting. But such is the power of Veggie Lee. I'm already thinking about getting a group of vegetarians together to give it a try.